In under three years, Glitterbox has possibly become one of the world’s most flamboyant, extravagant parties, with some top DJs laying down a soundtrack spanning 40 years of joyful, uplifting dance music. In a throwback to the glory days of disco and house, glamorous dancers and entertainers enhance the club experience, but the crowd are possibly the true stars of the show – open-minded, passionate, and encompassing all ages, colours, genders and sexual orientations. 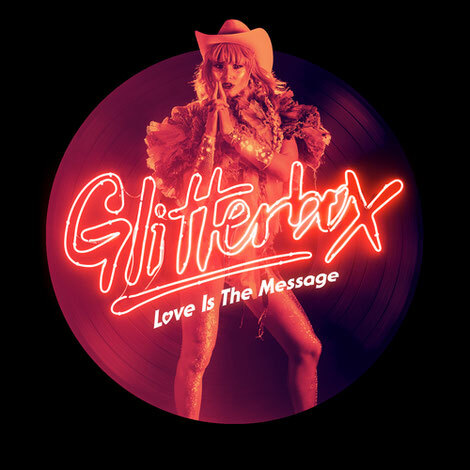 Glitterbox’s ethos is encapsulated in the title of its latest mix album: ‘Love Is The Message’. Compiled and mixed by Glitterbox founder and Defected Records boss Simon Dunmore, the album showcases the very finest disco, electro-funk and house across two DJ mixes. Artists such as Colonel Abrams, Tom Moulton and ‘Jellybean’ Benitez feature alongside the likes of Aeroplane, Midland and Kiddy Smile, whilst Frankie Knuckles, Masters At Work and Danny Tenaglia rub shoulders with vocalists Jocelyn Brown, Jackie Moore and Julie McKnight. Alongside the plethora of collectibles and classics, exclusive, brand new material comes in the shape of a pair of remixes from Glitterbox favourite Dr Packer, and Luke Solomon & Terry Grant’s live disco revision of Red Rack’em.